TOPCAT provides quite flexible graphical representation of symmetric or asymmetric errors in 1, 2 and 3 dimensions. 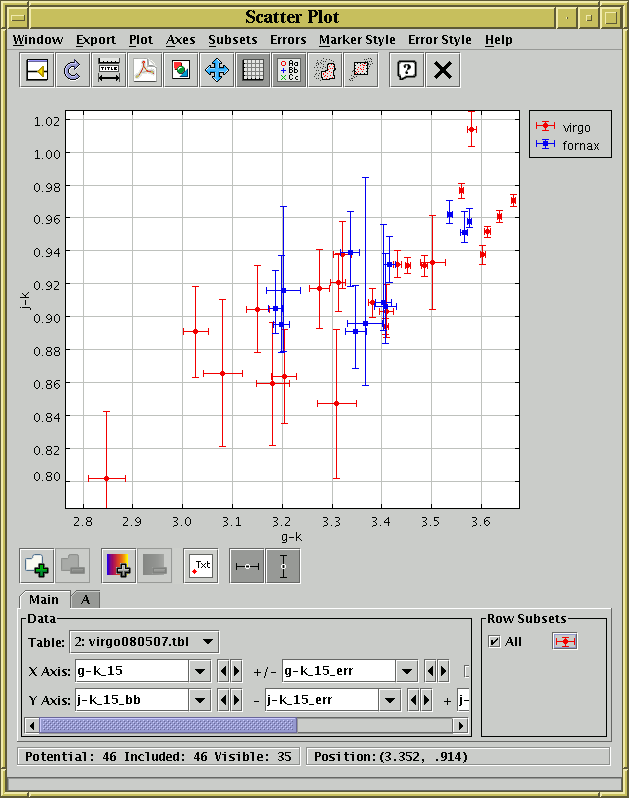 The plots with error bar support are the 2D, 3D and spherical scatter plots and the stacked lines plot. Any combination of them can be active at once. Clicking one of these buttons toggles symmetric error bar drawing for that axis on or off. When it is on, an additional column selector will appear to the right of the main column selector for the axis in question. If you fill this in with a column name or expression which gives the error for that axis, then the error bars will be plotted. TOPCAT may make a guess based on column names and UCDs about which columns provide error values for which other columns, so the error selector may get filled in automatically. However, in most cases you will need to provide the error values by selecting a column yourself, and occasionally you may need to correct TOPCAT's guesses. You can see that with the error column selector, the panel has become too wide for the window so a scrollbar has appeared at the bottom - you can scroll this left and right or enlarge the window to see the parts that you need to. These work in a similar way to the Cartesian erors above, except that the tangential one adds a single column selector, with an associated unit selector, near the latitude and longitude selectors to determine the isotropic angular size of error small circles. These give you different column selector boxes, but work in much the same way as the symmetric ones. There are many options for the plotting style of one, two and three dimensional error bars, including capped and uncapped bars, crosshairs, ellipses and rectangles. This plotting style is controlled from the plot window's Style Editor window (see e.g. Appendix A.5.3.1), which can be viewed by clicking on the marker icon in the Row Subsets panel at the bottom right of the window. The available error bar styles will depend on which axes currently have errors; if none do, then the error bar selector will be disabled. You can also use the Error Style menu to change the error style for all the visible datasets at once.